When people learn that Dave Leonhard ’62 once played Major League Baseball, they often respond jokingly, as in, “Boy, the Red Sox could sure use you now,” Leonhard relates. Not that he ever was a member of the Sox—Leonhard spent six seasons, 1967 through 1972, as a pitcher for the Baltimore Orioles—but he lives and works outside Boston. Leonhard’s tenure with the Orioles coincided with the team’s glory years, including three consecutive trips to the World Series (1969–1971), in which he appeared twice (1969, 1971). Leonhard arrived at Johns Hopkins in the fall of 1960 as a junior transfer student from Washington College in Chestertown, Md., and he decided to major in history. A self-described “horrible” pitcher in high school, Leonhard improved at Hopkins. A right-handed starter, he won three games while losing two, on one occasion pitching 13 innings and striking out 18 batters. Nonetheless, upon graduation, no professional scouts showed interest in him; that neither surprised nor bothered Leonhard, given that he never had entertained any illusions about playing pro baseball. That summer, he and some friends participated in a Baltimore-area amateur league, paying for their own equipment and uniforms, and in the fall, he began teaching American history at a local high school. During the academic year, Leonhard bumped into an Orioles scout who’d seen him pitch the previous summer. To Leonhard’s astonishment, the scout offered to sign him to a contract with the team. Unconvinced of his own talent and with a commitment to teach through June, Leonhard at first demurred, relenting only when told that he could pitch that summer for a monthly stipend in the Orioles’ low-level program. Come fall, he took a job as a social worker, resuming baseball activities in the minor leagues for the Orioles in spring 1964. Over the next several years, he pitched impressively, rising rapidly through the team’s farm system until he made his debut with the Orioles in 1967. Leonhard’s Hopkins degree earned him the sobriquet of “The Professor” from his Orioles teammates, whom he quizzed about U.S. history during games, “just horsing around.” But overall, he adds, players did not treat him differently because of his JHU education. Leonhard spent the 1973 and 1974 seasons back in the minor leagues, first for the Orioles and then, after being traded, with affiliates of the California Angels and Chicago Cubs, eventually moving on to serve as pitching coach and sometimes pitcher for two years with the Quebec Carnavals, a Montreal Expos farm team. A more secure career path materialized while Leonhard still coached and played in Quebec. In May 1975, he and his wife, Doris, bought a foundering flower shop and plant nursery in Beverly, Mass. 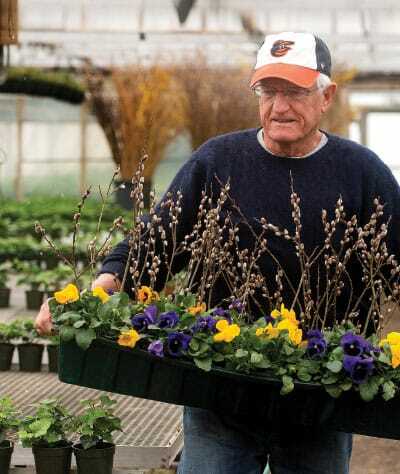 Together, the couple replaced greenhouses, added two wings to the main building, and over the past 40 years, transformed the place into a thriving full-service operation. Business varies wildly. “There are times in May and June and December when we work 12- to-14-hour days,” Leonhard says. “It’s a nightmare. Everyone wants their Christmas tree decorated at the same time, and everyone wants to plant at the same time in the spring.